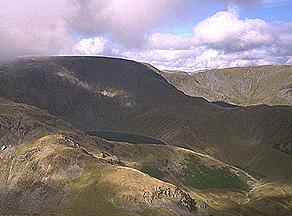 In the foreground are two spurs from Mardale Ill Bell; the nearer providing an easy route from Small Water, which is just out of the picture, and the farther the much more demanding North ridge, which rises from the egress of Blea Water. To the right of High Street, which was soon engulfed in cloud, are the Straits of Riggindale and the rise to Rampsgill Head. Larger version of this picture.